In early 2013, the Pentagon lifted the ban on women serving in U.S. combat units, mandating that the change be put into place by 2016. The lifting of the ban would open up more than 200,000 jobs in the ground-level combat force of the Army and the Marine Corps. From this order came several approaches to meet the 2016 deadline. The Marine Corps took an aggressive approach and almost immediately opened up its enlisted Infantry Training Course and Infantry Officers Course to women. While the completion rates of these courses among women were minimal, it’s still a pioneering advancement toward the equalization of opportunities for servicemembers in the U.S. The Army has taken a more cautious approach, first conducting studies on the physically demanding tasks artillerymen, engineers, Infantrymen, scouts and armored crewmen must perform. The Army recently invited women to apply for Ranger school. The strides the military is taking to explore the possibility of actually allowing women to serve in combat arms units are groundbreaking. This possibility might actually become a reality sooner than we think. The U.S. armed forces have a rich history of female involvement in combat roles. Unfortunately, as years have passed, the dynamics of the battlefield have changed, resulting in the obscuring of the history of and accolades for these early heroic women. For eons, men have dominated combatant roles within nations’ defense forces. Men have often proven their ability to prevail in ground combat situations emotionally, mentally and physically. Many lives have been saved on the battlefield by men with the capacity to make quick, sound, tactical decisions in the midst of the chaos that is war. Many believe that women are just as capable of doing the same things men are but have simply not been given the chance to show it. Limited access to actual combat MOSs is essentially stifling female servicemembers’ opportunity to showcase abilities they would not necessarily demonstrate in the traditional roles and positions in which they currently serve. The most voiced concern about the integration of women into combat roles is based on the differences in physical capabilities between men and women. Men have biological advantages over women. They are generally stronger, faster and more agile. For this reason, opponents of women serving in any combat MOS rightly say that the military’s physical standards must not be modified in order to make these MOSs more accessible to women. If female servicemembers are willing and capable of performing these physical tasks, why should their opportunities in direct combat occupations be limited because of their gender? In 2012, the Marine Corps opened its Infantry Officers Course to women. Unfortunately, all but one of the 20 women who attempted the course failed to make it through. Does this prove the theory that women can’t handle combat environments? Absolutely not; it just forces female servicemembers to have realistic expectations of whether or not they would thrive in combat situations. Female servicemembers who wish to take a shot at ground combat-type training should use the failure of these female Marines as lessons learned to better prepare them for their opportunity when it arrives. There are women out there who are completely capable of excelling in combat occupations. While there are still doubts about whether women are capable of handling combat environments, the women who have died in combat—and the women who have been awarded for their valor in combat—have shown they are capable. Consider Sgt. Leigh Ann Hester, a Kentucky National Guard soldier. She was leading a team on a mission outside Baghdad in March 2005 when her convoy was attacked by insurgents. She devised a counterattack with grenades and M203 rounds. Her unit killed 27 insurgents, and she killed three with her personal weapon. Her unit suffered no deaths. Her actions in this firefight earned her the honor of being the first woman to receive a Silver Star since World War II. Many fear that the standards that male servicemembers must adhere to in order to complete training—such as attending U.S. Army Ranger School or the Marine Corps School of Infantry, or being in Special Forces or the Navy SEALs—will be lowered to accommodate female servicemembers who wish to gain entry into combat fields. This is not the case. Several armed forces branches have begun studies comparing male and female participants’ physical abilities to complete certain tasks associated with combat jobs. The Army’s Physical Demands Study is geared toward assessing the strength, endurance and power required to do combat arms tasks. In 2013, the study began to look at the most physically demanding tasks various soldiers must perform in an attempt to determine how to measure a soldier’s ability to perform them in a specific job. The study will continue for three years before official results are released. Female participants in recent studies have embraced the idea of serving alongside male soldiers in combat arms branches. They truly have the desire to—and the belief that they can—excel in such branches. About one in five women surveyed said they were moderately or very interested in transferring to combat arms. Women under age 26 with higher-than-average physical fitness test scores expressed the strongest desire. These are the types of candidates that combatant commanders should want within their ranks. Also more likely to be interested are women who served on cultural support teams or female engagement teams, and those serving within the combat support community or combat service support branches. They are familiar with how combat arms units operate, the expectations of the soldiers within the unit and the physical demands placed on those soldiers. Combatant commanders in the special operations forces community have already begun utilizing women to augment troops in various ways on foreign soil. Female engagement and cultural support teams have proven to be valuable assets to the special operations forces community. Women have the ability to gain access to the portion of the Afghan population—50 percent—that male soldiers have found inaccessible. Women are able to engage the female and child population, build trust and rapport with them, and potentially gain information that can be invaluable to tactical and strategic commanders in theater. The U.S.’s most recent conflicts have demonstrated that the military needs women integrated on the battlefield at many levels and locations. Their female insight, empathy and capacity offer an avenue to gather information from host-nation women and children that could mean the difference between a mission’s success or failure. As a young female officer with a higher-than-average physical fitness score, my desire to serve and lead soldiers in a combat zone—whether as a combat multiplier or actually assigned to an occupation within the combat branch—is very important to me. I chose the branch I am currently in because a Military Police platoon leader can be placed on a litany of mission types and lead a platoon of soldiers while in an active theater. Although the Military Police Corps Regiment is not a combat arms branch, the sheer nature of its mission sets places all MP soldiers in combat situations every day downrange. I value having the opportunity to lead soldiers in the fight against our nation’s enemies on foreign soil and potentially having a direct impact on the outcome of war. If I have the confidence in myself and my ability to do these things for my soldiers and country, then my leaders should too. I should not be professionally held back from occupations because of my gender. The standards of an Infantry or Armor officer should be blind to gender and equally enforced. I’m certain that my personal beliefs about women in combat are shared among many women in the armed forces. If we do not believe in the things we know we are capable of doing, then we will never accomplish them. If our beliefs and capabilities fall short and we fail to meet the standard, then at least we can say we were given the opportunity and we tried. If we are never given the opportunity to succeed and excel in combat arms roles, we will never know our true potential. The U.S. is moving toward a more equalized armed defense force, and to do that it needs to consider the opportunities offered to every single one of its servicemembers. 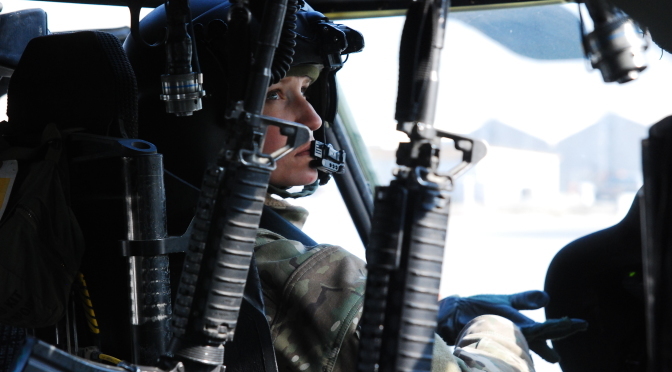 The idea of a woman serving in combat arms is now becoming a more realistic possibility. The strides taken to initiate the process of integrating women into combat roles in the armed forces are significant. They will shape the way the U.S. structures the implementation of women into these roles and will impact the lives and careers of the pioneers who wish to embrace the opportunity. 1st Lt. Raquel S. Felder is an executive officer for the 72nd Military Police Detachment, Fort Bliss, Texas.